This past year in the AFL has been one of the most action-packed seasons many fans have witnessed. There have been thrills and spills throughout the year, injuries, retirements and new blood looking to make headway in the coming season. With all of this drama packed into a single season, let’s look at some of the more light-hearted, funny moments that the 2014 AFL season gave us. This AFL rising star has taken AFL by storm for his speed, presence and his ability to take those outstanding contested marks. But, everyone can have an off-day. Starring against Gold Coast, Patton takes a penalty kick late on in the game and completely shanks it into the second tier of the stadium. The ball didn’t even come into play, leaving a throw in for his Gold Coast opponents to lap up. Patton’s Giants teammates couldn’t have appreciated his accuracy in this instance, but one lucky fella in the audience certainly did. Brendon Goddard isn’t one to shy away from controversy, and in this instance has a little too much aggression for his own teammate. After an umpire decision goes against him, Goddard lashes out at the first person in front of him, only to find out that it is in fact his own teammate Ben Howlett. Howlett looks a little shocked when he realises who just dished out the justice as Goddard continues to berate the Umpire. 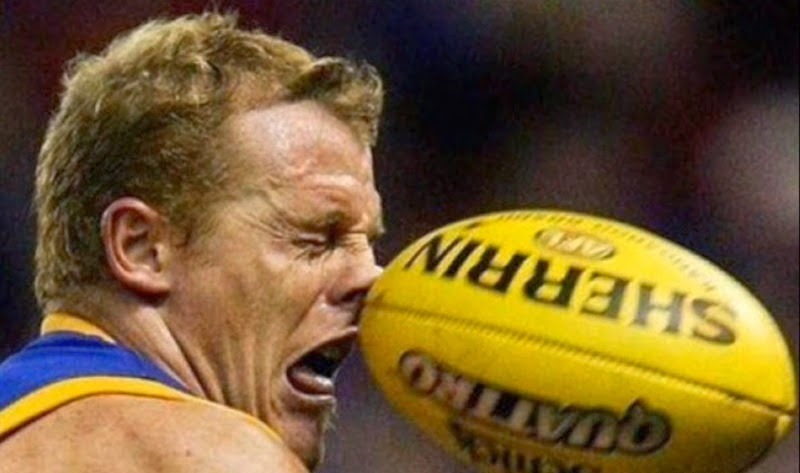 In a hotly contested match between West Coast Eagles and Fremantle, one of the umpires got a little bit carried away in the action to see Chris Mayne getting a closer look at the action. The umpire runs along the boundary line without seeing what is in front of him, slipping and sliding into Mayne as the pair fall to the floor. Ross Lyon has already had to cope with a number of injuries this season, now he may have to look at protecting his players from the officials, too. Carlton (and now North Melbourne) player Jarrad Waite is watching play after losing the ball to his Richmond opposition when a player he takes down kicks out a foot in anger. Jarrad furiously holds his face in what appears to be a terrible kick to the face, but instant replays show Jarrard was gently brushed on the chest by his opposition player Jake King. Jarrard may be drafted with North Melbourne for the forthcoming 2015 season, but there may be a chance his acting career may reach new heights if he keeps this simulation malarkey up! Essendon number 16 Courtenay Dempsey takes it all in his stride as he makes a powerful run through the midfield against Gold Coast this season. He stumbles and loses the ball from his grip and the ball falls behind him. Not even turning to look for the ball, he sticks out a foot and back-heels the ball back over his head and grabs the ball out of the air to continue his run. Unfortunately he gives the ball away further up the field, but if this is a sign of his true potential, he has yet to reach the heights this demonstration of technique is yet to afford him. The 2015 season is looking like one of the best to come this New Year, so keep an eye out for the highs and lows, thrills and spills that are yet to be made. Will we see different teams in the finals series or will it be dominated by the big few? Let’s hope for big things this season!